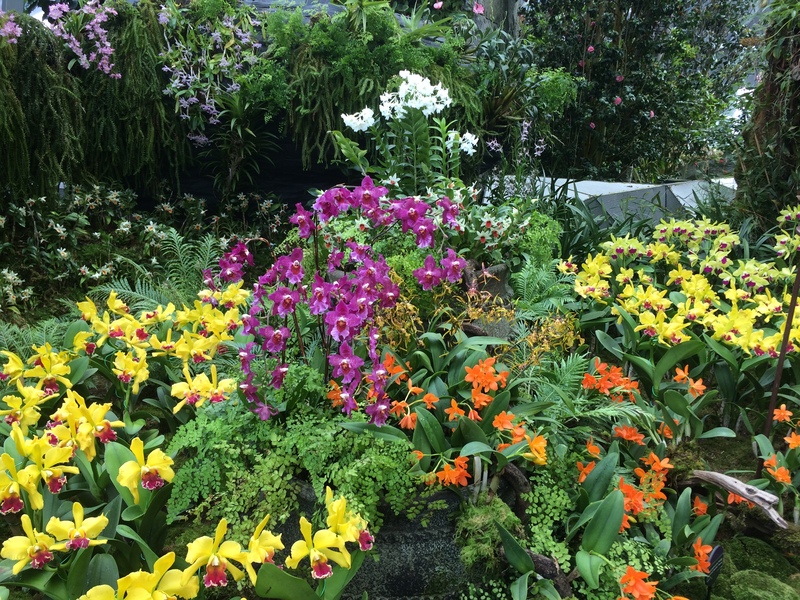 If you love visiting gardens, and happen to be in Singapore, then you must visit The Gardens by the Bay. Even if you don’t, or think you don’t you should still visit, as the gardens are really well worth visiting. The gardens opened in 2012, and as well as the outdoor area, there are two temperate domes or conservatories and the iconic ‘Supertrees’. Coming from cooler climates, we are used to seeing greenhouses with plants from tropical or at least warmer zones. Here we have the opposite, with cool houses for temperate plants, which also means they are really pleasant to walk about instead of the tropical heat outside. The outdoor parts of the gardens are free, so you can come and go as you please. We took the MRT underground to the gardens, getting off at Bayfront, which gave us easy access to the Heritage Gardens, a collection of four themed gardens. These are designed around history and culture of Singapore’s three main ethnic groups and colonial past, with Chinese, Malay, Indian, and Colonial Gardens. One feature that can be seen from various points around the city are the Supertrees. These are vertical gardens, between 25 and 50 metres high, and which are lit up at night. You can do a sky walkway, but I decided it was probably not for me! Still, they are quite something to see, and I am sure the views are spectacular. I was really eager to go to the conservatories: the Flower Dome and the Cloud Forest. The Flower Dome is the largest glass greenhouse in the world, and contains plants from the Mediterranean and semi-arid subtropical regions. The area is divided up into different zones or gardens: Australian, South African, South American, Californian, an olive grove, a succulent garden and an are with baobab trees. In addition, there are changing displays in the Flower Field, which reflect different seasons and festivals. When we were there, there was a magnificent display of begonias of every colour and shape you could imagine. The theme for the begonia display in the Flower Field was ‘under the sea’, and the displays of flowers interwoven with the sea creatures was quite something! I’ll let the pictures below speak for themselves. Fish swimming in the begonias! We walked from the rainbow display of flowers and sea creatures to the succulent garden, where there was a sort of Alice in Wonderland theme going on…or as the notice said…Aloes in Wonderland (!!). It is with checking before you go to see if any parts of the gardens are closed for maintenance. The first day we were there, the Cloud Forest was closed, so we went back on our last morning on Singapore to see it. There are charges for both domes, but they are both really worth every penny. The Cloud Forest is a 35-metre tall indoor ‘mountain’ that is also home to the world’s tallest indoor waterfall. A lift takes you up to the top, and you slowly make your way down through wonderful displays of orchids and other plants. The whole place is kind of like a movie set, and we kept expecting to see some sort of creature or an Indiana Jones type character come leaping in front of us. All in all, this is somewhere worth taking time to go to when in Singapore. It is easy enough to get to, and there is something quite unique about the displays.